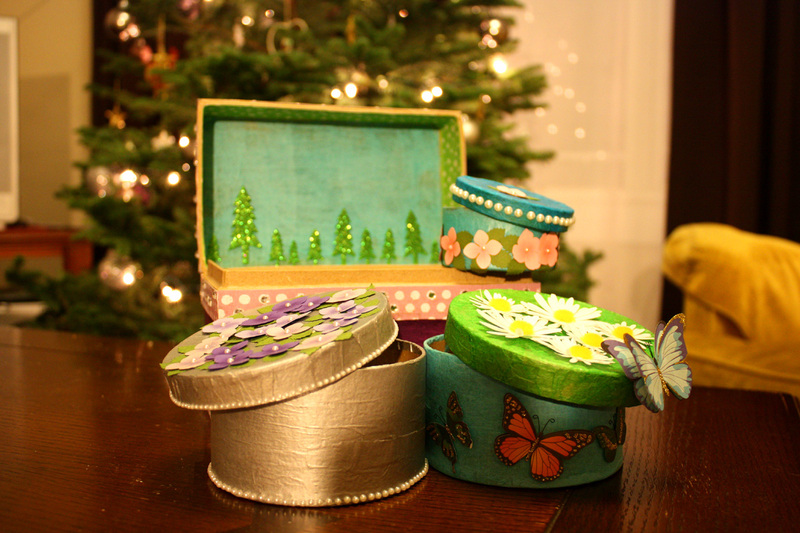 I also made decoupage boxes for my friends, a project that my craft group from work had taken on a couple weeks back. I chose personalized themes for each box and got to work. And I think they turned out to be nice, thoughtful gifts and I really had fun making them. I decorated one box with some sparkly pine trees reminiscent of camping trips we took and included pictures inside the box from the trips. Two of the boxes had hydrangea stickers (from the Martha Stewart collection again!) the native flower of the Portuguese islands two of my friends' families are from. And the last box was covered in daisies, another friends favorite flower, and butterflies. So those are the homemade gifts I gave my friends, it was a lot of fun choosing the themes and decorating the boxes......I already have stickers picked out for a box for me! And thanks to my crafting friends for giving me the idea! !